FRIDAY UPDATE–In answer to the question, “How did the seminar go?” Actually, a great group of enthusiastic fishermen and women showed up–actual count of 106. We’ll probably do it again this fall… Wipers were big, but a surprising number were interested in black bass. (Me too.) And we will be having some big news on that species soon…. For boaters visiting Lake Elsinore, now that the firefighting seaplane Hawaii Mars is stationed at the north end of the lake, the City has announced some safety measures have been put in place in case the flying boat is suddenly called into duty–as it was Friday and again on Saturday…. On a lesser note: The City in conjunction with the Elsinore West Marina (and me) will be holding a four-species (depending on what folks want to know) fishing seminar this Thursday, July 23, beginning at 7 p.m. The cost is three bucks (you can pay at the door and I don’t get a nickel). Everyone gets a hotdog and drink and some materials that should be helpful. And we’ll have some nice raffle prizes (including a free launch and day-use pass) and we’ll try and make it fun, and helpful. Give the lake department a buzz (951) 674-7730 if you think you’re coming. The marina address (across from Lakeside High School) is 32700 Riverside Drive, Lake Elsinore, 92530. This entry was posted on Saturday, July 18th, 2009 at 12:35 pm	and is filed under News. You can follow any responses to this entry through the RSS 2.0 feed. You can leave a response, or trackback from your own site. Good luck with your seminar George. I’d be there but I can’t make it. 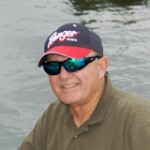 I’ll be out with a Ronnie Kovach Owner Fishing Schools trip. The lake has turned green with algae. Carp are still biting but all others have stopped. Sorry I can’t come to the seminar. Edward, your assessment is pretty up-to-date. But actually, the catfish have been on a pretty good chew as well, and I have some seen some dandies. But the current water conditions are pretty typical of the lake at this particular water level (around 1241 and change) and all the more reason that fulfillment of predictions of a mild El Nino condition this winter would be a great help. One of the reasons for the seminar is to talk about specific seasonal patterns here-because they are more extreme than in any reservoir in Southern California. Personally, I’m looking ahead to the October through April period here. And hoping for rain, too. Word to Jared: Chartreuse and white, 1/8-ounce RoadRunner is the answer to your question.